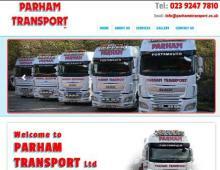 Parham Transport Ltd are a family run Hampshire haulage company based in Havant, midway between the cities of Chichester and Portsmouth in the South East. With over 25 years of experience, Parham Transport Ltd offer nationwide haulage services with its modern fleet of road haulage vehicles. Parham Transport in Hampshire, boast a team of experienced and knowledgeable drivers that will transport your cargo 7 days a week. Providing cargo & freight transport from Portsmouth, Southampton and across the UK, delivering nationwide & into Europe. Parham Transport’s road haulage services include tail-lift deliveries, contract distribution, multi drop deliveries, depot to depot trunking and delivery of shipping containers.